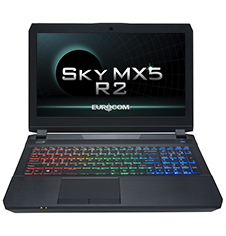 If you want to take things up a notch, the Sky MX5 R2 is the Gaming machine for you! The “X” isn’t just for show; it X stands for the eXtreme upgrade you’re getting over the M5 R2. We’ll take you from a casual NVIDIA GeForce GTX 1060 (6GB DDR5) graphics card to a serious GTX 1070 (8GB DDR5) graphics card. This will give you an increase in frames-per-second (FPS) on 1080p resolution of approximately 37%, and an increase of approximately 30% on 4K resolution. The MX5 R2 keeps a slim form factor with this GPU upgrade, and a light weight of 2.65kgs! To make sure you get the performance you want, you can customize your system’s memory with up to 64 GB of DDR4 RAM, and you have space for up to 4 storage drives (two M.2 slots and two 2.5 inch storage bays, for a maximum storage capacity of up to 6 TB). All of your data will be kept secure with a Kensington lock, biometric security, and Eurocom’s Trusted Platform Module (TPM) data encryption. TPM encrypts all your data so only you have access to it, even if your machine is misplaced or stolen. The brushed aluminium and heavy-duty casing will keep your choice of a Full HD, IPS, G-Sync panel, 60Hz, 120Hz for first-person shooters, or a 4K UltraHD, IPS display, for epic fantasy lovers! Kick your gaming in high-gear with no draw backs!